Check your own blog here. And I write like an elderly woman. What’s up with that? I used the word “skillz” in one of my posts and everything! Thanks for the laugh! I am a 66-100 year old man. I’m a male between 66-100. 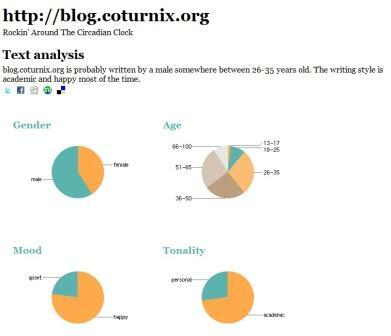 At least my writing style is academic and happy most of the time! What fun: delayed2sleep.wordpress.com is probably written by a female somewhere between 66-100 years old. The writing style is academic and upset most of the time. I too am supposedly male, 66-100 yo and a happy academic, LOL greta one Bora!